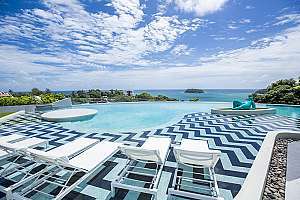 A Phuket born and developed family business who operate both resorts and apartments on Phuket island makes the heart of the newly formed AKSARA Collection. Having operated for over25 years, proud parents Khun Patrasin and Khun Supaporn Phatharaworanee foresaw the development in tourism on the island since their early days by developing the Patra Mansion which was the first serviced apartment in Phuket town. In 2000, the family continued to expand their portfolio by building the 60 roomed resort 3 star plus Kata Sea Breeze Resort just behind the sands of Kata beach. Over the years, the resort was expanded and today boasts 330 guest rooms and suites with an average room sized at 44sqm! During 2014 saw the beginnings of the expansion in operations and the springboarding of their properties into the international travel market. Mum and dad passed the daily operations of the properties to their three daughters and started the expansion of the team to take their properties forward. Khun Kanokkorn (Som), Khun Anchisa (Fon) and Khun Phanwara (Zea) have now started to look into the future with 'AKSARA Collection' having been created to provide the properties with an identity and a localized brand with the slogan “A touch of Phuket happiness”. 'AKSARA' was created by the sisters using their own names side by side. ​An established Management team with many years of combined experience has been set up to continue to further improve guest experiences by focusing on centralising non-guest contact operations; therefore releasing manning guides to guest contact team members, and to position all properties into the international market place. • Environmentally friendly to both local communities and the islands of Southern Thailand in the sourcing of local products, recycling programs and energy savings. AKSARA Collection is currently developing a new 4 star plus project with a renowned designer Oracle. Situated on 5 rai and 2 ngam of the families land with an initial investment of 500 Million Thai Baht, the resort has been named ‘The SIS Kata Resort’ referring to the three sisters who have joined hands in the influence on the design and concepts of the resort. Officially opening on 27th April 2017, ‘The SIS Resort Kata’ has been very well received by many of our current partners as a offering a fresh and much needed newly built resort in Kata. © , Aksara Collection, All Rights Reserved.